When I first heard that Microsoft would be placing hardware restrictions on manufacturers, I imagined boring, uniform designs. Fortunately, the Samsung Focus is undoubtedly a Samsung phone with its glossy piano-black face and rounded edges. Super AMOLED is fantastic–you really have to see it up close to appreciate it fully. Colors burst out of the display, and animations appear lively and smooth. Some reviewers have noted that colors look oversaturated, but I don’t really mind the effect. While the display also does quite well in bright outdoor light, the phone’s glossy hardware sometimes throws off a blinding glare. The Samsung Focus is an attractive, well-designed phone that has a great camera and a speedy processor. But AT&T customers have a tough choice: The Samsung Captivate, which is also $200 with a two-year contract, has these attributes plus access to the huge Android Market. Windows Phone 7 delivers when it comes to usability and performance, but the amount of content users will have access to remains to be seen. Android already has a proven track record of being a great operating system; Windows Phone 7 will have to work hard to win over consumers. The Samsung Focus takes the best parts of Samsung’s Galaxy S hardware and drops the new Windows Phone 7 OS into the mix. The phone is a classy, thin touchscreen, eschewing the sliding keyboards and gimmicks of the other Windows Phones hitting the market. But with Xbox Live tiles and a focus on friends, is this still a phone business users can get behind? The Samsung Focus is a wonderful piece of hardware. The screen is superlative, among the best I’ve used on a mobile phone, and the build quality and design are excellent. The phone sounds great during calls, gets good cell reception and snaps fine pictures. Battery life could be better, but it wasn’t the worst I’ve seen by a long shot. So that’s my advice for business users. Wait for support. If you use your phone more for fun and games, for pictures and social networking, the Samsung Focus might be a fine choice. But if you need to stay productive and communicate with the rest of your corporation, Windows Phone 7 is not going to get the job done, at least not yet. Let’s just hope that Microsoft hasn’t abandoned its core constituency, business users, completely, because the phone starts with a fantastic base design, and I think business users would enjoy an option completely different from the iPhone and other interface designs on the market, if Microsoft can help them get their jobs done. So here we have it: Microsoft’s attempt at making a modern smartphone. What’s the verdict? From a hardware perspective, the Focus is a huge win. 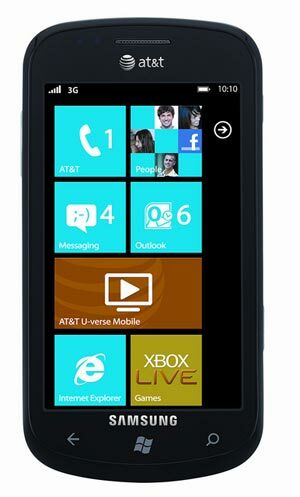 It’s fast, has a beautiful screen, and it represents Windows Phone 7 very well. From a software perspective, Windows Phone 7 is truly a compelling mobile operating system. It’s totally different than any other smartphone platform, and that’s a good thing. It’s incredibly stable, it feels smooth and refined, and it looks like the key apps are going to be there when the marketplace fully launches in October. We just wish that Microsoft had included important features like fast app switching, copy and paste, removable storage, and a whole lot more before going gold with the platform. But Microsoft has designed Windows Phone 7 to make updating the software much easier than previous versions of Windows Phone, so hopefully our wishlist gets checked off in the not too distant future. I give the Samsung Focus a 4.5/5. If you’re set on Windows Phone 7, the Focus is a really fantastic choice. In the end, the Focus is as good as it gets for Windows Phone 7 devices without a keyboard. The only question is, will WP7 be enough to tackle your everyday smartphone needs? Chances are, unless you are a power user that relies on heavily on Google services, needs comprehensive app availability, and uses a smartphone as a business tool, the Focus will do you fine. Otherwise, wait until WP7 matures a bit more. Put bluntly, the Samsung Focus is the first Windows Phone that matters. But how good is it? I really can’t tell you frantically enough how magically the Super AMOLED screen complements Windows Phone 7’s interface. It’s like dark chocolate peanut butter cups topped with blowjobs. It’s fast. The Windows Phone 7 interface, as frenetically flippy as it can be, never chugs. Same goes for more graphically intense games, even if the load times are longish, bordering on angst-inducing. The subtly angled back, which echoes a Nighthawk stealth bomber, hints at more daring design ambitions lurking at Samsung. I’d like to see what the crazy engineers at Samsung could really do. Samsung and AT&T’s added apps, while both minimal and blissfully uninstallable, are actually good, thanks to the solid framework Windows Phone has provided them. A pretty nice U-Verse app for AT&T customers, and Samsung’s Now news & weather app fills a hole in the default Windows Phone app lineup. It does what it’s supposed to: Humbly bends over on its hands and knees to serve as an altar holding up the largely fantastic software, Windows Phone 7. The glossy plastic and fake chrome isn’t just tacky, it makes a phone loaded with high-end technology feel cheap, like a high-end call girl wearing pleather pants. Unfortunately, it’s something of an pandemic for Samsung phones, which I would love 10,000x more if they just felt nicer. The GPS lock on Maps was indecisive and bouncy. Normally it’d be hard to tell if it’s a software or hardware problem, but it’s not the first Samsung phone of this ilk to have GPS problems. Was never really thrilled with the call quality, either. Capacitive buttons for the Windows, back and search key are a terrible idea. I can’t tell you how many times I was flung out of a game of Rocket Riot to the home screen by accidentally tapping the Windows key. The Focus is kind of the everyman of the Windows Phone 7 line. It doesn’t really have any fancy features and isn’t especially stylish… but it gets the job done. If you’re in the market for a WP7 handset, here in America you don’t have a huge amount of options. We prefer the Focus over the Surround (for you AT&T buyers), but there isn’t such a wide amount of differences between the two that either one would be a bad choice. The Focus is thinner and sleeker to some extent, though its plasticky build leaves a lot to be desired. Still, it’s a solid, comfortable phone that works exactly as you’d expect, and if you’re the photo snapping type, you’ll be pleasantly surprised by its prowess in that area. At the end of the day, a lot of people will find that the Focus hits the sweet spot — for us, it just slightly misses the mark.